Barnsley College students have created their very own red ribbon to mark World AIDS Day. 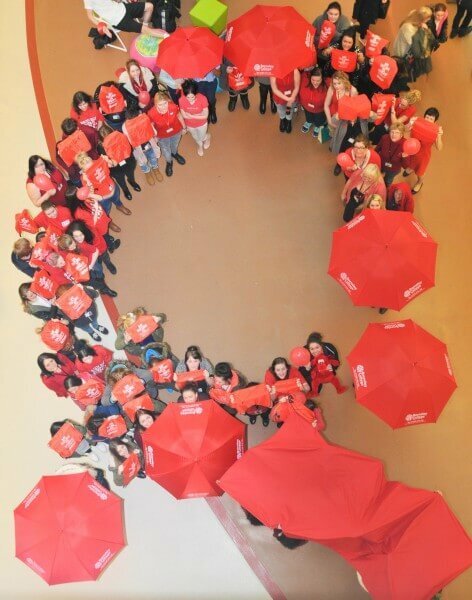 Learners from the Early Years and Care department wore red t-shirts and held red umbrellas in the college atrium to form the ribbon, which is the universal symbol of awareness and support for those living with HIV and AIDS. The re-creation of the ribbon was part of a project across the department to raise awareness among students of HIV and AIDS, particularly the impact upon people living with HIV and AIDS and their families and friends. The project was led by Tutorial Team Leaders Jenna Galley and Claire Griffin. Claire said: “We worked with the students over the course of a week on this project, which provided our learners with an understanding of how HIV and AIDS impact upon peoples’ lives. To find out more about studying on an Early Years and Care course at Barnsley College, call the Information Team on 01226 216 123 or email info@barnsley.ac.uk.